Donald Duck by Steiff. This beautiful hand made piece, in white mohair, is one way jointed and wears the white ear tag, signifying this item as a Steiff limited edition, together with the famous gold plated Button in Ear. Limited edition of only 2000 pieces worldwide. With his jointed head and bendable arms and legs, you can pose him how you wish. Product details: safety eyes, synthetic filling material, non growler, size tbc.. Comes boxed, together with a numbered certificate of authenticity. Size 25cm. Ashby Bears proudly presents the famous Donald Duck. 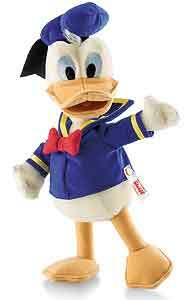 Premiering in 1934 - Donald Fauntleroy Duck is one of the most popular Disney characters and was included in TV Guide´s list of the 50 greatest cartoon characters of all time in 2002. Donald is most famous for his semi-intelligible speech and his mischievous and temperamental personality. He can be happy, he can be angry, he can be short tempered yet positive. Whenever scared, his fear is replaced by anger. And he never backs down from a fight - whether it be with ghosts, sharks, mountain goats, giant kites, or even the forces of nature. And, more often than not, when he fights, he comes out on top. The Steiff version of Donald is made of finest white mohair and limited to 2,000 pieces.